Don't miss the chance of building your dream home in our unique gated community. Lot 7 5.9 acres 639 ft. lakeshore SOLD! Lot 6 2.96 acres 280 ft. lakeshore SOLD! Lot 5 1.4 acres 180 ft. lakeshore SOLD! Lot 4 2.02 acres 315 ft. lakeshore SOLD! Lot 3 1.08 acre 200 ft. lakeshore SOLD! Lot 1 1.18 acres 315 ft. lakeshore SOLD! 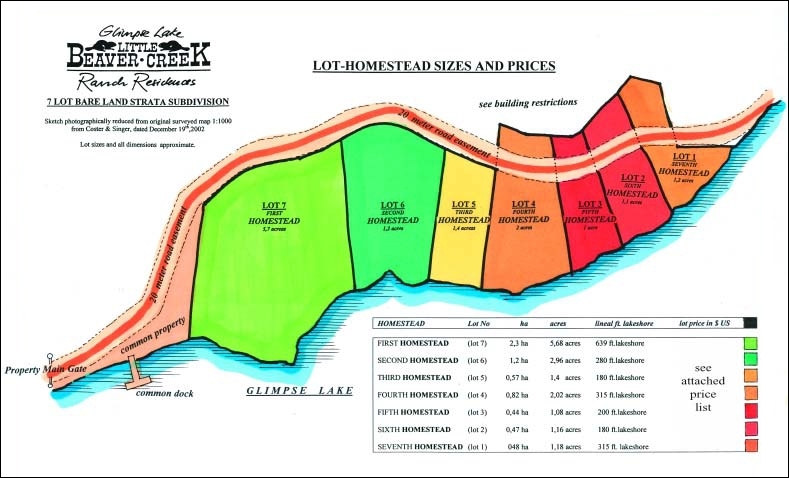 Your lot is provided with water, roads, telephone and power to the property line. You grade your own driveway style and build your own individual septic system. Build your dream home on one of only two remaining lots. 1,15 acres (0,47 ha), 180 ft. (54.86 lm.) of lakeshore, water, power and telephone on site. Certified pressurized septic system to be built by buyer. Land for septic field across road included. Light slope towards lakeshore with some trees along the access road (dead end). Good soil (mainly gravel) and nice height overlooking the lake. Southern exposure. Sunny. Undisturbed view from the whole lot to the lake. Building permits by TNRD Kamloops. Own building scheme (see disclosure statement) and restrictive conveyances with Home Ranch. Shared deep well (340 ft.) with lots A1 and A3. Power from BC HYDRO and TELUS landlines underground to the lot. ...while immersed in your busy life, often far away from Glimpse Lake, can be difficult. That's why we offer you our help and expertise with all aspects of making your dream come alive from preliminary sketches to scheduling, permitting, engineering and building - partial or turn-key. Sketch from first rough ideas..
From small round log cabins to roomy log lodges. ..to floor plans and engineered drawings.. Rough sawn or hand-hewn square log buildings with dove-tail corners, piece-en-piece or timber frame. ..or even three dimensional views or virtual tours of your dream home. Standard frame construction with lap siding or rough sawn board and baton.